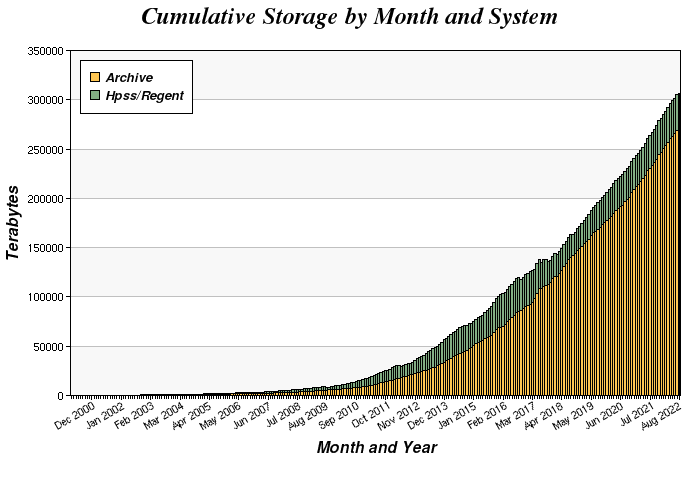 The growth in NERSC's storage systems amounts to roughly 1.7x per year. 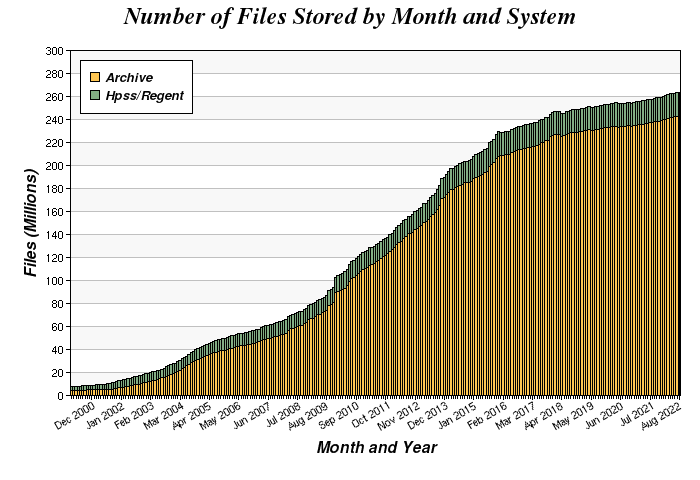 The growth in the number of files stored is less than the growth in the number of bytes stored as the average file size has increased over time. The average file size as of August 2003 is about 30 MB. The median file size is closer to 1 MB. 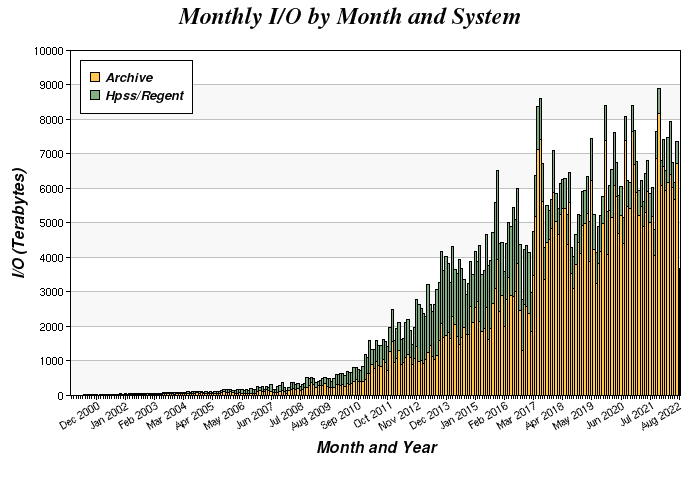 The growth rate of I/O is roughly the same as the growth rate of the number of bytes stored. As a rough rule of thumb, the amount of I/O per month is about 10% to 14% of the amount of data residing in the storage systems. Additional graphs show the last 30 days of activity for the amount of I/O and the number of files transferred. A yearly summary is shown in these bar charts which show the growth and distribution of the I/O traffic between storage and network destinations. Both systems share the same StorageTek tape library system, comprising 4 interconnected SL8500 tape libraries and around 120 StorageTek tape drives. About 40,000 tape cartridges can be stored in these 4 tape libraries. In addition, the systems also share a complex of 4 interconnected StorageTek Powerhorn libraries with around 35 tape drives. 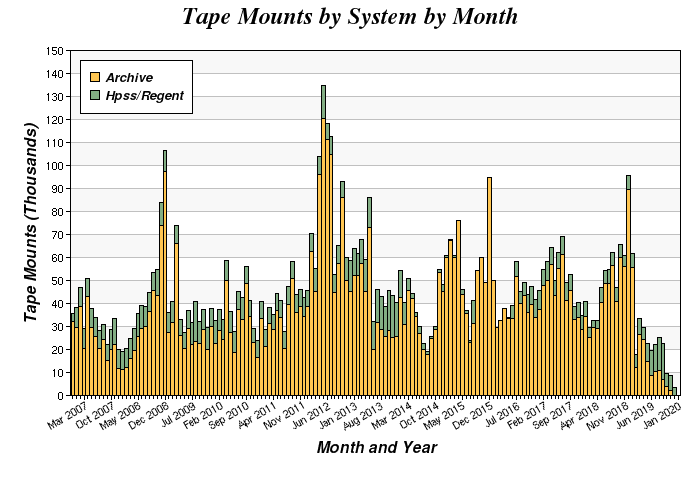 The data on these older and lower capacity tapes is being migrated to the higher capacity tape in the SL8500 libraries. The Powerhorns are scheduled to be decommissioned by the end of 2010.